I apologize for not writing a blog last week. My goal is to write one every Friday or thereabouts, but last Thursday I took my family to a cabin in the Great Smoky Mountains to spend a long weekend. This was the first time we had done this together as a family, and I appreciated this opportunity for a change a scenery and some time away from my ministry responsibilities. 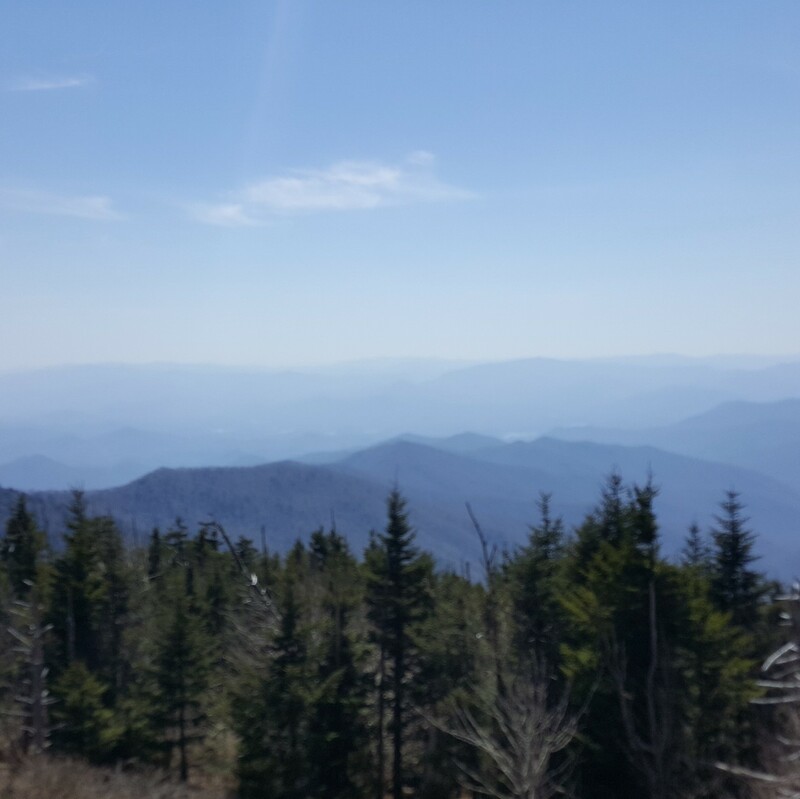 During our visit there I visited the Clingman’s Dome visitor center. The view from there was stupendous. The mountains stretch out as far as the eye can see, and they were just beginning to come alive with new spring growth and blossoming trees. This may sound odd, but I was impressed with the numbers of people who were there just to see the sights. Some were all decked out in hiking regalia, ready to take on the challenge of a mountain trail. Others were there with family, taking pictures of one another, with the mountains as a backdrop. There was a constant bubbling hum of joy—of sharing the common appreciation of the beauty and wonder of the creation. To me, this is the calling we all have and that we share in, whether we realize it or not—to bear witness to the glory of God, and all he has done and all that he is. In many ways, this is a hint as to what we are called to as God’s adopted children—to revel in and celebrate the wonders of God’s goodness, love, and grace. This theme continued on throughout the visit for me. One afternoon I went over to Cherokee to sit by the Ocanaluftee River and do some personal reflection. The water was swift and clear, running over rocks and creating little spurts of white here and there. The trees were just beginning to put on leaves, and some were filled with flowers. The birds were singing their hearts out, creating a pleasant atmosphere. The place where I sat was surrounded on all sides by the mountains, so it seemed tucked in and cozy. Down the river from me, a man was fly fishing, without much success that I could see. A couple of children were playing in the water opposite from where I was sitting, pretending their dolls were swimming. Upstream, two girls were relaxing in the water where it was deeper, coming up occasionally, soaked and laughing. A couple was pushing an elderly lady across the pedestrian bridge in a wheelchair, stopping occasionally so she could enjoy the view. Groups of families were having lunch together, their voices carrying across the water to where I was sitting. It occurred to me after a while that I was experiencing one of those moments in life which are foretastes of our future with God in the new earth. We’ve been talking about the new earth and heaven at our Wednesday night discussion group, and we’ve seen the scriptures which describe the new earth where God comes to dwell with humanity forever. The apostle John describes a river, the water of life, flowing from the presence of Abba and his Son—the ever-flowing river of the Spirit of life in Christ Jesus. We find our life, our renewal, and our healing in him. The life we live together forever will be the perichoretic life in which the Father, Son, and Spirit have existed for all eternity. Their way of being is filled with outgoing love, generosity, and creativity, and we have been made to share in this through Jesus and by the Spirit. Our future life as glorified humans will be filled with such beauty and joy, we can only catch little glimpses now. We anticipate the day when we all will live together in each moment in the truth of our existence as human beings—loving God with all we are and loving our neighbor as ourselves. There will be ongoing joyful celebration of all God has made and all God has done through Jesus and by the power and presence of his Spirit, forever. It is essential for us as broken people to take time to slow down enough to catch these “glimpses of joy.” It is good for us to be attentive to the signs of eternity which are evident all around us, but we often are too busy or too broken to attend to. When we allow ourselves to have eternity on our minds, we will find ourselves recognizing these moments more easily, for they are all around us, happening all the time—but we are usually too busy, distracted, or pain-filled to notice them. What the Word of God did in coming into our human flesh and joining our humanity with the divine Being, made possible for each of us a sharing in the life and love of God even now. We have the future to anticipate, but we also have the present to enjoy. God has brought us into relationship with himself. He has done in Jesus Christ all that is needed for us to share both now and forever the blessing of living in his presence. But God does not force himself on us. He has reconciled himself to us in Christ, and he invites us by the Spirit to reconcile ourselves with him. He has brought us into oneness with himself in Christ, and by his Spirit invites us to accept, embrace, and live in the truth of this. He has created a future for you and me which is filled with joyful celebration of all God has done and all he has made, and offers it to us to receive it and begin to participate in it even now. By the Spirit, Abba calls to us right now, saying, “Come rejoice with me! All is well! Drink up—the water of life is all yours! Don’t just take a sip—soak in it, play in it, build your life around it, let it affect and influence all of your relationships, decisions, experiences—from now on into eternity.” We are to trust in the blessedness of the gift of God’s Son and live, both now and forever, in the truth of our being as God’s adopted children, in and through Christ and by his Spirit. This is our real life, and one we can begin to experience right now, as we are willing. Abba, thank you for the blessed gift of joy and celebration we have in your Son Jesus and by your Spirit. Thank you for all your blessings, all you have created for our enjoyment and pleasure. Grant us the grace to be attentive to the glimpses of glory you give us in our everyday lives, and the grace to always live gratefully and joyfully in your presence both now and forever, through Jesus our Lord. Amen. This entry was posted in Blog Site and tagged Christ, creation, eternity, forever, God, God's love, grace, healing, Holy Spirit, humanity, in Christ, Jesus, joy, life, live, lord jesus christ, love, nature, participation, person of jesus christ, power of the holy spirit, relationship, relationship with god, relationships, renewal, Spirit, spring, Trinity, triune god, trust, truth.